The Very Inspiring Blogger Award – Two Rights Attempting To Make A Left! 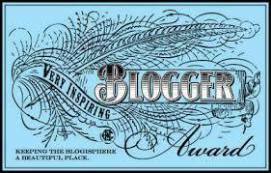 ‘The Very Inspiring Bloggers Award’, has honored our blog a second time already this year! We truly appreciate the nomination and we are honored that usazorropress.wordpress.comfelt compelled to send the nomination back to us. We are tickled with their patronage and appreciate their loyalty A big thank you to everyone who has taken time out to visit our blog. We appreciate every visit. We love the comments. God bless each of you and please, keep coming back! This entry was posted in inspiring blogger award, Life as we know it and tagged God, Inspiring Blogger Award, Nomination, Tools, WordPress. Bookmark the permalink.